Student's 10th summer with Discovery! Radley College, one of Britain's leading independent schools, was founded in 1847. It is situated in Radley village, 8km south of Oxford, 3km north of Abingdon and just over an hour by road or rail from London. The nearest airport is London Heathrow. The campus, set in 325 hectares of parkland, is welcoming and completely self-contained. The facilities for study and recreation are outstanding. Sporting facilities include football, rugby and cricket pitches, athletics track, tennis courts (hard and astroturf), a Real Tennis court, squash and fives courts, indoor 25m 6-lane swimming/diving pool and sports hall. There is also an impressive drama theatre and large IT suites. 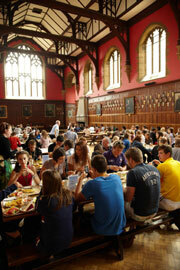 All meals are taken in the historic oak-panelled dining hall. 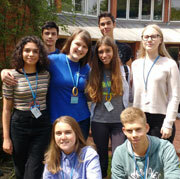 We offer an intensive, truly multinational programme and a chance to meet English children. 22.5 hours' tuition per week including English Skills, English Workshops and end of week presentations. 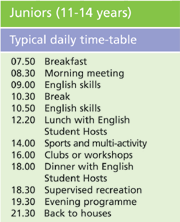 Exciting range of English Workshops e.g. British Humour, Castle Constructors, Digital Photography, Maths Warriors, Game Design, Music Video and more! 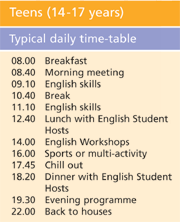 Lots of opportunities to experience British culture and speak English with our English Student Hosts! Special weekly events for 16+ years (optional) include late evening programme (e.g. karaoke, movies and extra accompanied Oxford visit). Airport transfers on published arrival/departure days for flights arriving/departing between 09.00h-15.00h from/to Heathrow aiport, please click here for more information. All levels. All the basic skills are coached and practice matches arranged. "Looking forward to welcoming you in 2018!"